Feb. 10, 2010 -- Rick Stroud, a native of St. Petersburg, Fla., will be the second speaker in the spring resumption of the Journalism Alumni Speakers Series at Arkansas State University. 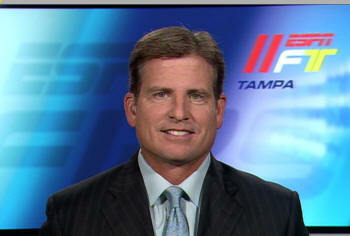 Stroud, a 1982 graduate of ASU, is a National Football League reporter for the St. Petersburg Times and ESPN. He began working for the Times shortly after graduating from Arkansas State and has more than 25 years of experience in multi-media journalism. While at ASU, he was sports editor of The Herald and a scholarship baseball player. During his career, Stroud has reported on national sporting events, including the NCAA Final Four, the Major League Baseball Playoffs, and twenty Super Bowl games. While working as the beat writer assigned to the University of Florida at the St. Petersburg Times, Stroud’s stories documented NCAA rules violations by the football and basketball programs. The stories, which won Stroud second place for Best Investigative Reporting by the Associated Press sports editors, led to sanctions against both Gators programs. Stroud began covering the Tampa Bay Buccaneers and the National Football League in 1990. During that time, the Buccaneers underwent six coaching changes, the death of owner Hugh Culverhouse, the sale of the franchise to billionaire owner Malcolm Glazer, a stadium referendum, and the celebration of a Super Bowl XVIII victory. His reporting was referred to in Tony Dungy’s best seller, “Quiet Strength,” particularly because it was Stroud who informed Dungy of the Bucs’ plan to replace him with Giants Super Bowl coach Bill Parcells. For the past six years, Stroud has been one of five NFL Insiders appearing weekly on ESPN2’s First Take and has contributed regularly on ESPN’s SportsCenter, NFL Live, and Outside the Lines. Stroud will address students and faculty Monday-Tuesday, Feb. 15-16, in ASU’s College of Communications, he will meet with Chancellor Robert L. Potts, and he will take in the University of Louisiana-Monroe basketball game on Monday, Feb. 15, at 6:15 p.m.
For more information, contact Dr. Joel Gambill, chair of the Department of Journalism and associate professor of journalism, at (870) 972-3075, or e-mail him at jgambil@astate.edu.